It's hard having to leave town with so much progress done yesterday. Metal legs are all cleaned up and quickly sandblasted (I'll take another pass before powdercoat prep), and one of the wooden tops hand planed to all of its leveled glory. It's always exciting to see the pieces together and really get a sense of the overall form. Looking to come back and hit it hard Monday. My good friends Jordan and Tessa reached out to me recently for a new coffee table. I'm glad they did; that small hiatus from the shop was a little longer than anticipated. I met Jordan on his first week at FredSparks as we pulled an all-nighter sketching headphones concepts (which went on to became the JBL Grip series...check them out here). 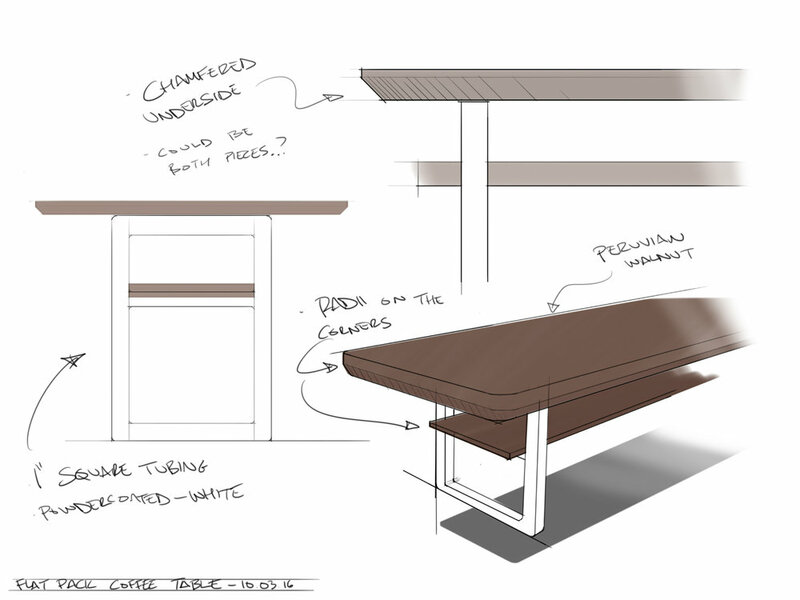 With Jordan's passion for design, and Tessa's sharp eye, the ideas for this table came pouring out. 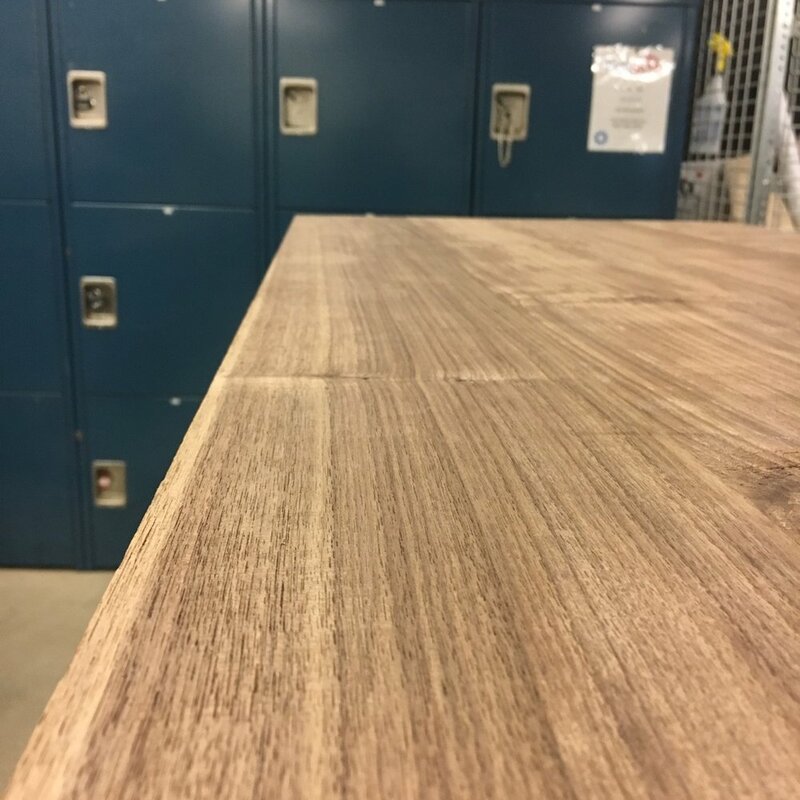 From a wide range of mid-century modern forms, we narrowed in on a two-leveled walnut table with powdercoated steel legs. 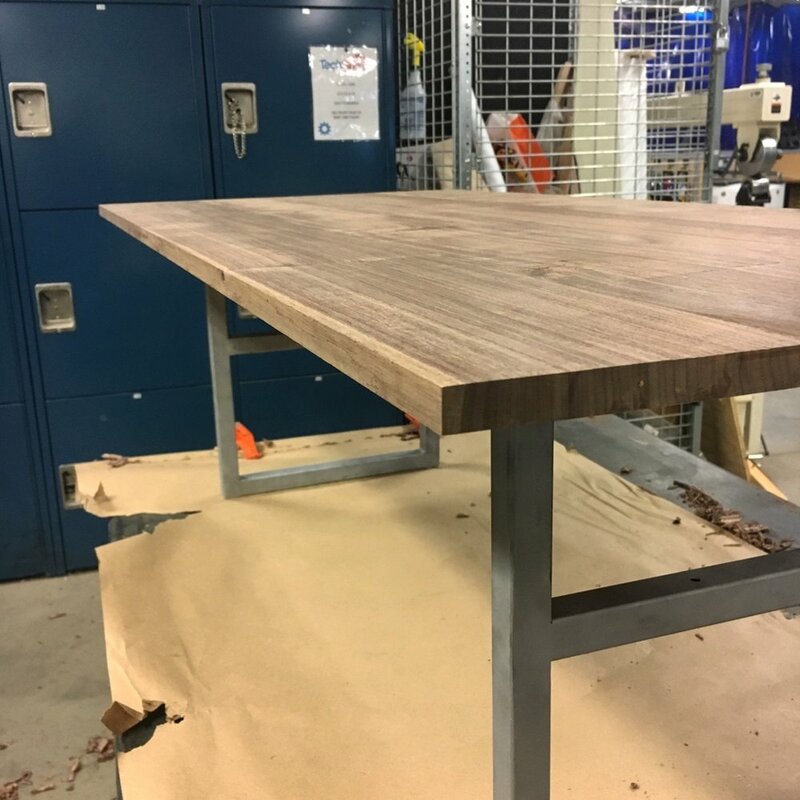 Ultimately, this table is aimed for flat-pack shipping and will be able to be broken-down and reassembled with only a few pieces of hardware. Aptly named after the tiny king of the house, I can't wait to get working on this new piece! 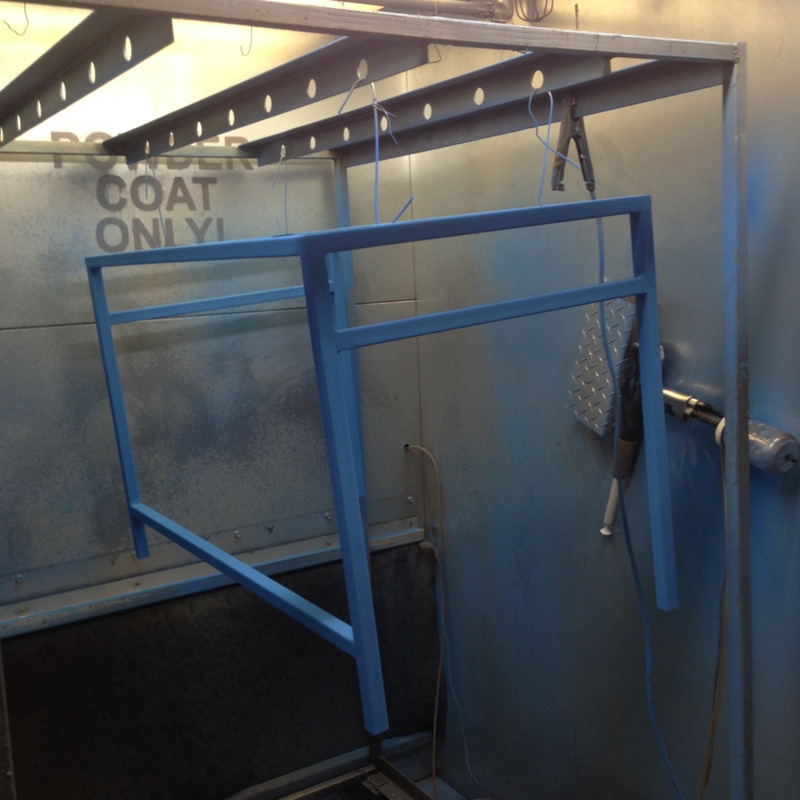 One of the skills at TechShop that I knew I wanted to learn was powder coating. 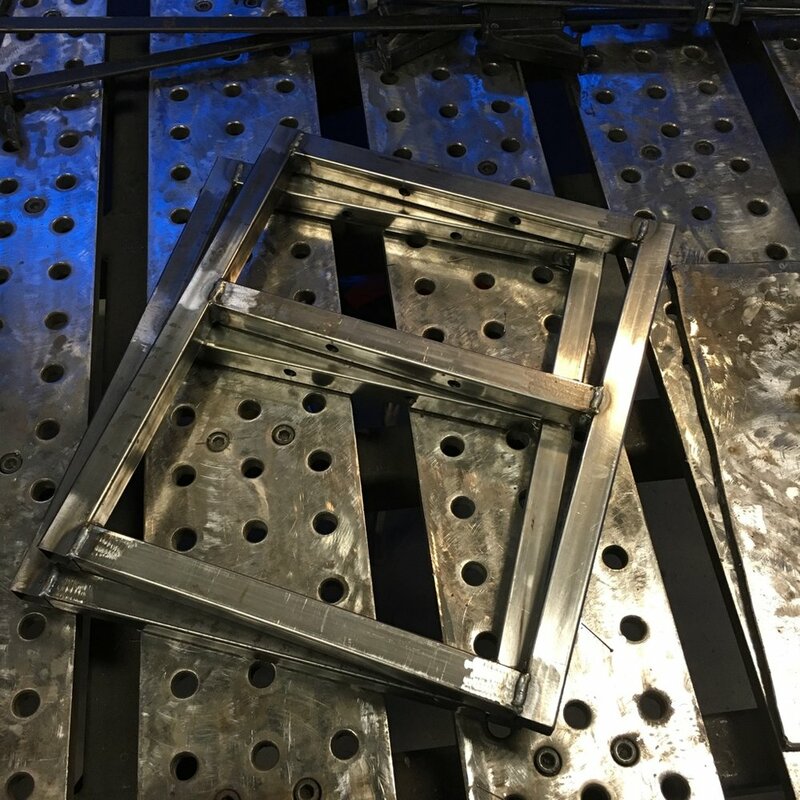 Surprisingly, this was of the easiest pieces of equipment to pick up and produce some great finishes. I wanted to add a bit of contrast to the ash desktop, and ultimately landed on this "Ford Light Blue - RAL 5012." Just like most finishing/painting projects, the devils are in the details - and that means prep work. Luckily for me, a quick wipe down with TSP and fashioning some hooks to run through the mounting tabs and onto the cart was all I needed. Had one serious grin once I stepped back to see how all these pieces came together. I learned a ton throughout this project and I'm glad I revisited the welding process. I am also very glad for YouTube and angle grinders. Next step is prep and powder coating. Ok.... So maybe not quite there just yet, but we're getting somewhere. Progress is happening. Progress is good. Goodness is happening. Moving back to the metal side of the shop this week. Prior to this project, I spent only a few hours with MIG welding and I'm looking to build up this skill set. This square tubing is going to become a powdercoated base for a wooden drawer and desktop. I am really pleased with how this set turned out! With a coating of butcher block oil, I love the richness of the walnut and how that curly maple pops in the light. Looking forward to delivering these to the happy couple. Lets party! 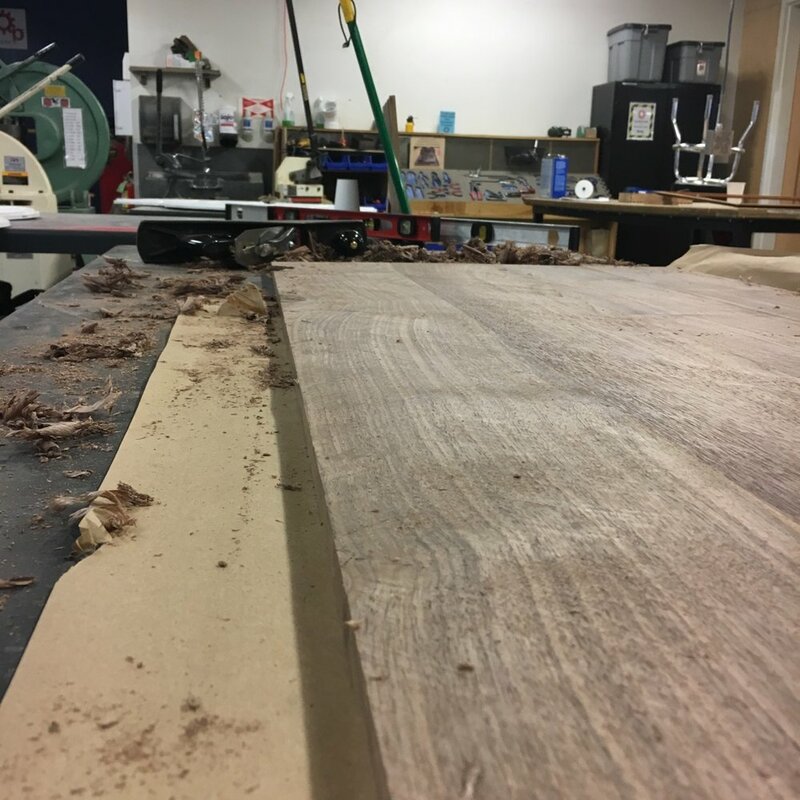 Once the boards were joined and planed, it was time to figure out the pattern for these cutting boards. Knowing Troy was more of "pinstripe over checks" kind-of-guy, I came up with these two lay outs. With contrasting sizes and patterns, I am excited to see this set come together. Pittsburgh is certainly a different city than what it was three years ago. Pack up the box truck and head eastward, I am a salmon swimming back upstream. As I am returning home and taking time to think about my next steps, I am looking forward to getting back to my roots and working with my hands. Now, more than ever, the maker community and spaces in this city are booming and creativity is flowing. I have a couple ideas already rolling around in my head, but first on the list is a set of cutting boards for some great friends of mine back in St. Louis. 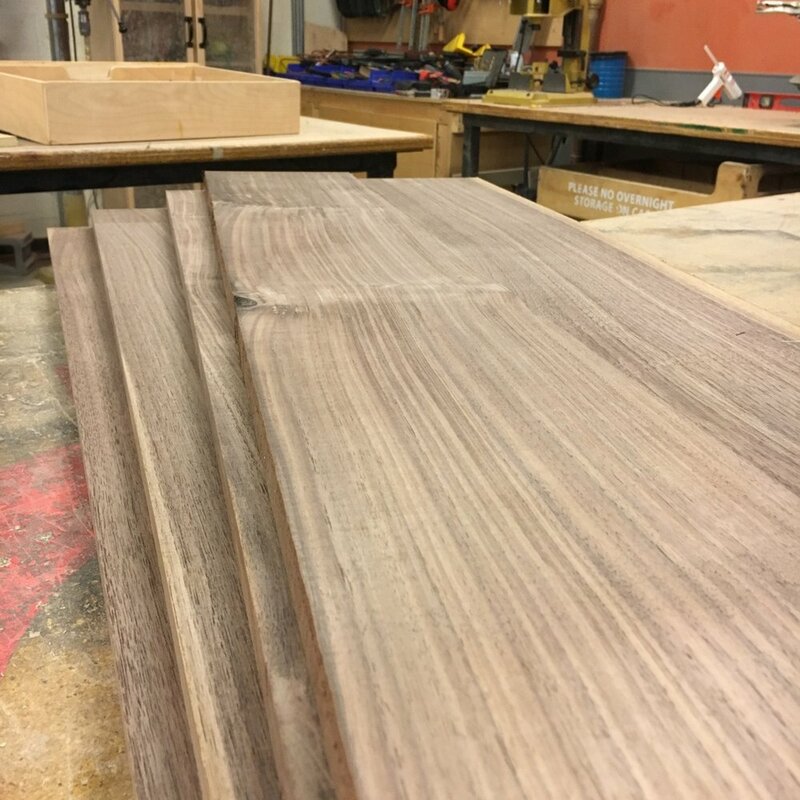 I've talked with Troy almost everyday for the past three years and whether it's cars or guitars, he most always have a vision and taste for materials; especially the pairing of walnut and maple. So, off to the lumberyard and into the shop. Can't wait to get started!